From the kitchen of One Perfect Bite...I found this recipe several weeks ago while searching for dishes that would allow me to use the large cans of chopped clams found in warehouse stores. It was originally developed by Craig Claiborne, a prolific food writer and editor at The New York Times. 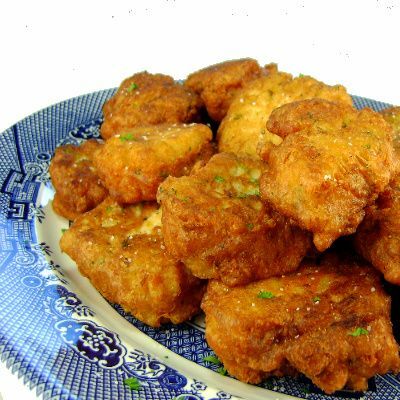 He called the recipe Bonacker-Style Clam Fritters and considered it to be a perfect example of authentic American cooking. Bonacker is the name given to natives of the East Hampton, Long Island. Fortunately, this dish had been featured at Saveur.com and I was able to retrieve the original recipe from their files. I wanted to make the dish as it was written, the only substitution being the use of canned for fresh clams. The most difficult part of this exercise was determining how much meat would actually be harvested from 4 dozen cherrystone clams. Available search engines failed me, so I splashed water on my face, put on some lipstick and went for a chat with my guys at the fish market. Based on the assumption that all the cherrystones were the same middling size, the guys were certain - certain mind you - that I'd need 2-1/2 cups of chopped canned meat to equal the amount that I'd get from freshly shucked clams. It, of course, took another 20 minutes to explain why I was going through the exercise in the first place and by the time I left the market I wasn't quite sure why myself. At any rate, I made it home and we had great fritters for dinner. These are less doughy than most I've had and I really enjoyed them. I think you might too. Here's the recipe. 1) Sift together flour, baking soda, and baking powder in a mixing bowl. Whisk in eggs, lemon juice, clam juice, milk, butter, and cayenne, whisking until batter is smooth. Add parsley and clams, then season with salt and pepper. Mix well. 2) Add vegetable oil to a heavy skillet, to a depth of 1⁄8-inch, and heat over medium heat. When oil is hot but not smoking, spoon about 2 tablespoons of clam batter for each fritter into hot oil. (Work in batches and avoid crowding pan.) Fry until golden on one side, then turn fritters and continue frying about 2 minutes more. Make sure fritters are cooked through. Drain on paper towels. Season to taste with salt and pepper. Yield: 16 fritters. I have never had clams in my life, but if you offered me these, I would try them!! They look amazingly crisp, light, and yummy. Clam fritters made with clam juice & real clams is pretty amazing & special too! These look so good! I am sure I would enjoy this too, especially with some spicy dip!yum! I would like ti try this interesting recipe...thanks a lot and may you have a nica HAlloween!!! I loved hearing about your "in the field" research, and these fritters look well worth the effort! Gosh these will sure be so delicious, have nevr had these !! U rock , happy weekend! Thank you for the conversion - great work! Your fritters look fantastic! Never knew that you can make fritters with clams. Thanks for sharing! A far superior way to make this would be with "chowder clams," actually Atlantic quahogs. They can be found frozen in tubs without too much difficulty. They proved much better texture and flavor than canned clams. These look perfectly crisp and absolutely delicious, Mary! I love clams-These look so good and crispy. A little bit of cole slaw now, and it would be perfect! 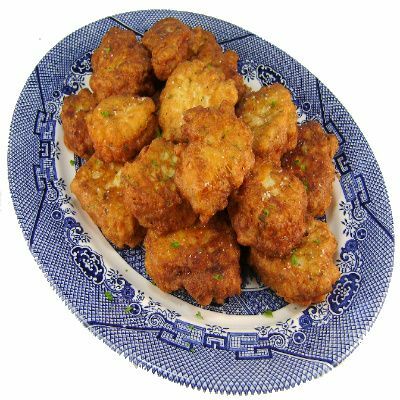 You can also use fresh or frozen chopped conch and have Conch Fritters. When I lived in Key West that was our choice because of the fresh conch. Either is fabulous. The fritters look wonderful! I usually make mine with prawns, but clams sound great too! Happy Halloween by the way :). This look fabulous! Never had clams fritters before! Thanks for sharing! I have never tried clam fritters before, but now I want to eat that entire bowl. I like clams on their own, so I can only imagine how much I would love them coated in batter. Thank you for sharing love! My husband is a big clam lover. I'll have to give this one a try! I grew up on Eastern Long Island and my father would make clam fritters for breakfast. What a great aroma to awake to!